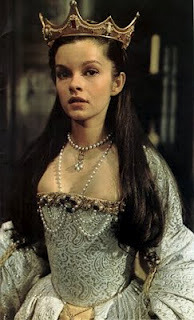 Geneviève Bujold as Anne Boleyn. . Wallpaper and background images in the Tudor History club tagged: tudors anne boleyn england queen geneviève bujold anne of the thousand days. This Tudor History photo might contain dinner dress, dinner gown, formal, evening gown, polonaise, fedora, felt hat, homburg, stetson, and trilby.